I had some trepidation about sitting with Judgment that I can’t quite put my finger on. I’m not sure what made me nervous before I started but I persevered and here is a record of my session. I used the same opening as all the last cards and soon I felt a tingling sensation across my scalp on the back of my head. This was the sign of the arrival of the spirit. I asked, “how can I use your energy in my life?” The angel in the image on the card seemed to spread its wings and the angel says, “flight”. The wings seem to keep extending until they have encircled me and further to encircle and embrace the world. Then they suddenly shrink down until they appear like ears on the angel’s head and the angel says, “listening deeply”. At this point my phone rings. We all freeze. When it finishes the angel smiles at me. I ask, “are you Gabriel?” At this the angel gets a rather serious expression on its face and says, “among others”. I ask, “what is the purpose of your trumpet?” Again I get the shiver across my leg but the vibration seems to leave my leg and expand and turn in to the vibration of a note played on the trumpet. The vibration spreads and soon it is vibrating all creation. And the angel says, “penetrate to the core”. I ask, “what is you connection to The Lovers?” [the tarot card]. Around me the room seems to grow a little darker and the angel says, “I bring the lovers to their end”. I ask, “what is your connection to Temperance?” [the tarot card]. The angel shines with a divine light and says something that I don’t catch. Then it starts to play the trumpet but I can’t hear anything. Then, quite apart from the figures down below I see a man appear next to the angel on its right. On the angel’s left flames appear. The angel says, “I am the other side of Temperance.” The angel puts its hand to its ear as if listening for something. I ask, “who are the figures below?” At this I get a vision of people on the earth falling dead and their spirits rising from their bodies and ascending to heaven. The angel says, “they are the graves of the conscious and the unconscious.” Then the angel points to the figure in the card image that resembles a corpse. The corpse’s head is a swirl and the angel says, “this gate is the same as my gate,” and the angel also points to the ring of clouds from which it emerges which now resembles the same swirling shape that is the head of the corpse. Then the man in the grave at the bottom of the card starts to say something; he raises his hand slightly and opens his mouth to speak. He appears to be ready to argue and question the angel. The woman looks at him fearfully. The angel will not let him speak. The man wants to plead his case but Judgment is beyond placating. Too late. The decision has already been made and the actions here are repercussions of that decision. The woman is hiding something in her hand. It is a small stone, a jewel. She mistakes it for her heart. The corpse, who has nothing, is a direct conduit to God. The corpse’s head becomes the opening of the angel’s trumpet and the Will of God comes echoing out like music. Then I see the light of the angel grow so intense that it sweeps across the earth, scorching the hills like a burning scythe. It reminds me of a similar vision I had with the Death card so I ask, “what is your connection to Death?” the angel says, “we both work the gate. Where Death recedes I expand.” And I understand Death as receptive and inward moving and Judgment as active and outward moving. At this I decide it’s time to wrap this session up. I thank Judgement for speaking to me. I ask that Judgement be my ally and to be at peace and then I end the session. This week I sat with the Sun. Here is how it went. First it may be notable that my candle was reluctant to stay lit as I began this working. The flame was really small for several minutes before it perked up and burned with a more regular light. I sat with the card before me and even before I formally made the call the rays of the Sun in the image seemed to be in motion. I used the call that I’ve used for all the previous cards and after a few moments the Sun’s face on the card begins to slide in such a way that the two halves become asymmetrical. The left side of his face slides up and out of alignment with the right. Then I hear, “I encompass all things.” I am a little taken aback by a spirit using words to announce its arrival. The rays of the Sun appear to be emanating in energetic spirals. I ask, “what lessons can you teach me?” The face of the Sun changes again to resemble an aged face of indeterminate gender. He says, “wisdom of age.” Then the face changes again to that of a man with a thick mustache. His lips are pursed as if he is whistling or singing but I don’t hear any sound. The rays of the sun resemble arms and legs in motion as if he is dancing. He’s wiggling around dancing and singing. I ask, “who are the children?” The Sun seems to ignore me. He just keeps dancing and singing. The children say nothing. So then I try to be more direct and ask “children, who are you?” They say, “the blind and the sighted,” and nothing more. I ask, “how may I invoke your blessing?” The Sun keeps dancing again seeming to ignore me but I am patient and I wait for the answer. After a while he says, “push from your center.” Then the rays of the Sun become jets of fire shooting out with considerable force. He says, “you are all sighted and blind.” By this I take it he means all of humanity. I ask, “how do I know when I am blind?” He responds, “you are always blind.” Then the rays from the Sun take on the appearance of crystals that erupt from the surface of the Sun to form long spikes. I ask, “how can I determine falsehood?” The Sun says, “the dance will be out of rhythm.” Then a small cloud appears to the side, obscuring some of the rays. I ask, “how can I be a better creator?” But again the Sun ignores me and just keeps dancing and whistling. I ask, ”Will there be a time when you cease to shine?” and he gives me the obvious answer, “yes, at the end.” Then the rays take on the appearance of a thousand arms with groping hands all reaching out seeking something to grab. These hands are very different than the rays of the dancing Sun. They are more like human arms. The energy of the dancing ray arms was that they were pushing out from the Sun, these the energy is more receptive, almost hungry. It is rather disconcerting. 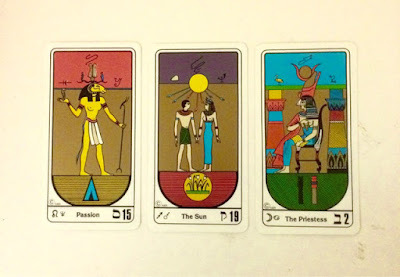 I ask, “what is your connection to the Four Kings?” In response the Sun forms into a compass rose and it begins to spin like a top. As it does this I understand that the Four Kings form the points of the compass rose and the Sun is at the center. As it spins, blue fire jets from the surface of the Sun at various points. With that I decide to close the session. I thank the Sun and call it to be at peace. I thank it for coming and speaking to me. I ask the Sun to be my ally and to help me learn its lessons. Then I snuff my candle and it stings much more than usual. Maybe my candle snuffing callous is getting thin or maybe it was the influence of the Sun. I spent the last week sitting with the Moon. Here’s how my scrying sessions went. As seems to be the pattern my first attempt was much shorter than I would have liked because I was interrupted. For the first attempt I followed the pattern I have been; setting up a candle and propping the card up in front of me. I used the same call as with the previous cards and soon I felt a wind at my back even though I was sitting in a chair. Then, in the image on the card, curved lines formed on either side of the Moon and I saw that these line described the path of the Moon through the sky and it was at its zenith. This was the appearance of the spirit but just at that moment I was walked in on and so wrapped up that session. My second session was a couple of days later. Again I gave the standard call and opening. This time I didn’t feel any wind but when the spirit arrived the picture changed. The Moon got brighter and the rays emanating from her multiplied and moved as the shone. The Moon had her left eye closed but the right one was open. I asked, “how can I use your energy in my life?” In response the curved lines marking the path of the Moon through the sky reappeared as they had in the first session and she says, “cycles”. Then one of the dogs on the ground rises up and gets bigger while the other cowers down and gets smaller. She says, “dominance”. I ask, “what lessons can you teach me?” Without any changes to the image or visions she says, “isolation”. Then the face in the Moon changes to resemble a figure standing at what looks like a control panel of some kind. The figure is moving the controls on the panel. The Moon says, “driving,” and I understand the connotation to be to control the movements of a vehicle. I ask, “who are the dogs?” The Moon says, “they guard the ways. They receive the blood.” Then the dogs change to resemble two figures facing away from me and toward the Moon so I see their backs. They are bowing like devotees before an idol. I ask, “do the dogs have names?” The Moon says, “yes.” The one on the left is highlighted and she says “Clockwise”. Then the one on the right, “Counterclockwise”. Then each dog appears to become a swirl of color in the direction that bears their name. I ask, “what is your connection to the Underworld?” In response I see a man wearing a white cloak. He is rhythmically dancing. He’s some kind of priest, magician, or shaman. I ask, “how can you help me with my spirit work?” I see a dark shape with a brilliant light behind it. I can’t make out what the shape is. The Moon says, “hidden light.” Then I see a vision of a hand tossing seeds to hungry birds on the ground. Then a third vision in response to my question forms in the shape of a thousand faces all turning toward the Moon like an audience for a performance. Then I see wings open on either side of the Moon and it resolves into an emblem of a bird. The Moon says, “I am the connection to all the realms.” Then I see an image of a pair of cupped hands catching a moonbeam so that it shines in the palms. Then the dogs change shape and resemble two people who are clasping each other’s hands and pleading with the Moon, as if they are hopeful for some boon. I ask, “how can I connect to other realms?” The image of the Moon in the card shines brighter and the face fades away to reveal a void. The Moon is now a tunnel that I can look through or walk through. I decide that that will be for another time. At this point I’m getting pretty tired so I wrap up the session, asking the Moon to be an ally in my life and to help me learn her lessons and thanking her for coming and speaking to me. For various reasons I cheated with the Star. I did the scrying session in two brief sessions as opposed to one long one, and the second session was on a Saturday technically two days after I should have moved on to the Moon. But if you won't tell, I won't tell. The first time I sat for the scrying session I used the standard opening and soon I felt a cool breeze on my left forearm and then a wash of coolness over my whole body. I took this as the arrival of the spirit. I asked, "how can I use your energy in my life?" I feel a tingling sensation on the back of my head. I see the image on the card change so that it appears that the edges of the earth are curling up forming a bowl shape. The edges of heaven curl up to match the earth. She says "shortening of distances". Herons fly across the sky behind her. Then it appears that she is swimming, treading water. She smiles and the image on the card returns to normal. I ask, "what are the lessons you can teach me?" The image on the card goes dark except for the star at the top which shines brighter. She says, "navigation". Then she looks away and says, "longing". The sky in the image turns purple and blue, like twilight, and an elaborate crystalline lattice work forms over her and she says, "shelter". I ask, "what are your pitchers?" she says, "Oil and water. They flow where there is the most resistance. They are made from the Hermit's lantern." [By this she mean the vessels themselves.] She continues, "The stars flow through me and I give birth to forms. I flow through you as well." I ask, "where are you standing?" She says, "on the border of a far away country. I am the citizen of neither, I am in between." I ask, "What is the bird?" She says, "he is the carrion bird I keep at bay." Referring to her mentioning longing before I ask, "what do you long for?" Her eyes droop a bit and she says, "sleep. Release. An end to care." I ask, "what is your connection to the number 8?" In the image it appears that a wind picked up and it blows her hair around. She turns her head slightly and listens to the wind. Then her hair grows so long that it covers her entire body. I see a line, a path, extend from her up into the stars. She says "the path, the gates..."
Then I get walked in on and so ends the first session. The second session begins the same as them all with the same standard call to begin. This time it is the sky seeming to darken that announces the arrival of the spirit. I sit in contemplation for a bit and then I ask, "how many stars are there?" She says, "number beyond counting." I ask, "what is your message to me?" She points to the star above her which now appears to have a ring around it. She says, "your gravity holds others in orbit." Then she points to the stream of water that flows by her and she says, "energy is flowing by you all the time." Then I see that as she pours her pitchers in the stream a connection is formed and the energy flows back and forth, in both directions, from the pitcher to the stream and from the stream into the pitcher. Then a fishbowl with a goldfish swimming in it appears behind her. I get the impression that it is something like a snow globe, a self-contained little world made entirely of the the energy of the stream and I see it is analogous to the universe. I ask, "what is are the 8 paths and gates?" She does not answer me but the star above her seems to take on depth in 3 dimensions and it rotates in every direction. The center is indicated but beyond that there is no answer. At this point I'm getting kind of tired so I close the session. I thank the Star for coming and speaking to me. I ask her to be my ally, to help me learn her lessons, and to help me use her energy in my life. Chapter 9 of Book III of the Greer and Warnock translation of the Latin Picatrix gives us another very important set of details that, in my opinion at least, form a large part of the basis of the magic described in the book. It all comes down to the equilateral cross and identifying oneself as the center. We saw this same reliance on the equilateral cross in Chapter 6 of Book III with the Ritual of Perfect Nature. But where perfect nature is about honoring your connection to the universe, the rituals described in Chapter 9 are about honoring your connection to the planets. How to Attract the Powers of Each Planet and the Powers of the Spirits, Naming Them According to Their Parts, and How to Accomplish This By Speaking Their Names. Straight away in the title we are given the key to this way of working with the planets. Call the spirits by name to do what work you require that is under the auspices of the planet with who you are working. When you need a Saturn (for instance) working done, these are the names to call, these are the spirits under Saturn who actually get things done. And while this is a very important point to consider regarding this chapter, I think the application of these names goes further. The chapter begins with the names of all the spirits. The spirit of Saturn called Redimez is coadunate with all of his names, both collectively and individually, and with his parts which are above and below and elsewhere, according to the opinion of Aristotle in the book which he wrote for Alexander which is called the Book of Antimaquis in which he discussed the way in which the powers of the planets and their spirits ought to be attracted. This point about a spirit representing all the aspects of a planet gets repeated for all seven of them. In one way of thinking, in this example, Saturn is more of an office than an individual. It is Redimez that performs the actions of Saturn and it is Redimez that one speaks to when working under the auspices of Saturn. And their names, as listed according to Aristotle's opinion, are as follows. The name of the spirit of Saturn above is Toz, below is called Corez, to the right Deytyz, to the left Deriuz, before Taylyz, behind Daruz; and it motions in its sphere and its progress through the signs and the motion of its spirits- all the aforesaid are united in the name Tahaytuc. All of these separate names above are united in the primary name, Redimez, and this name is the root and origin of all the names we have said. The first question I have about this passage is "above what?". The conclusion I've come up with, and have been using, is that the magician using these names is the center from which they are oriented. It is instructive to remember that there are four passages in which these spirit names are given in context of working with spirits; twice in this chapter we're talking about now (Book III chapter 9), Book III chapter 8 (the one before this one), and Book IV chapter 9 (almost literally the end of the entire book). The chapter we are discussing now is the only one in which the names are expressed as individuals. In the other instances the list of names for each planet is simply called a prayer. So what does this tell us? One of the things it tells us that by calling out the names we are invoking the power of the planet. In practical terms this means that to fill ourselves with the energy and power of a planet we use these names. When I make my morning oblations to the planet of the day I light some incense and call each of the names, envisioning that particular spirit in that place. So in our Saturn example my oblation goes something like this. I light the incense saying, "I light this incense to the honor and glory of Saturn and the spirits of Saturn." Then while saying "Toz" I envision a light above me. "Corez," a light below me. "Deytyz," a light to my right. "Deriuz," a light to my left. "Taylyz," a light in front of me. "Dariuz," a light behind me. I envision that these spirits form a sphere around me with their light. When I envision the spirit of the motion of a planet, in this case Tahaytuc, I envision the sphere to start spinning around me and the spirit is a charioteer, driving the sphere through space. Then when I intone Redimez I envision a light at my heart that encompasses and connects all the other lights. By this method I fill myself with the influence of Saturn. Instead of quoting the next several paragraphs I will simply list the spirits because all the paragraphs that mention them are strikingly similar to the one above. Aristotle said all this in the book already mentioned, giving the aforesaid spirits the names just given, and asserting that these are the spirits of the parts of the universe, there being six parts in the climes of the seven planets. The names of these spirits are those that worshippers of the planets were accustomed to use, and which they habitually used in the prayers they prayed to the planets. You, however, ought to diligently pay attention to what we said earlier. This paragraph consists of three sentences, let's look at each of them. In my copy of the Picatrix the first sentence has a footnote in which the translators tell us that "The climes were basic concepts in medieval geography- regions of the earth arranged in bands from north to south". This brings up a second thing we can learn from the separate passages of the Picatrix all mentioning these spirits, namely, that they are to be called as a group. There are no instructions that say something like "if you are way up north call Toz and if you are way down south call Corez." Instead it is always a group of names given like an incantation. I can only imagine that what the authors (and translators) conceive of a clime is different than what I think it means and that, to eliminate any confusion, calling them all covers all your bases. The second sentence gives us a tone and an application for working with these spirits. The third sentence also has a footnote suggesting it is a warning against polytheism. Next, the philosophers said that from these spirits descend all the spiritual potencies of the same kind that come into contact with the climes and the world of generation. By praying to the aforesaid spirits, they accomplished miracles- from them riches and poverty emanated, for they gave, took away, and changed the course of these things. They had bodies in which they were clad, and were embodied with the same. Each of them had human beings in their climes, into whom their powers and spirit flowed, and they permitted them to arrange things with these sciences and make use of things of their nature. Since these spirits are the active aspects of the planets it is not surprising that it is from them that spiritual potencies descend. Nor is it surprising that miracles are accomplished or that they changed the course of things. But it is a bit surprising to hear that they are walking among us, either themselves or with their human allies. Are we to endeavor to be these allies? It also seems to me that a zoning ritual can be derived from this structure, perhaps involving all 56 names. I have not yet tried this but it seems a logical next step. Next, we'll take up the second part of chapter 9. New tarot deck for me. The Egipcious Kier Tarot, circa 1984. If there is one thing to love about the ancient Egyptians it's their Underworld mythology.